Despite the name similarities, curcumin and cumin are two completely different substances, although you may use both in cooking. Both have histories of different uses in alternative medicine. Sweet cumin, a common name for anise, and black cumin describe two spices not related to either curcumin or cumin. You can buy both curcumin and cumin as dietary supplements and in spice form, but ask your doctor about side effects and interactions before taking supplements. Curcumin comes from the rhizomes of turmeric, a member of the ginger family that gives curry its golden color. Cumin comes from the cumin plant, native to the Mediterranean but grown extensively in Egypt, India, Iran and Morocco. 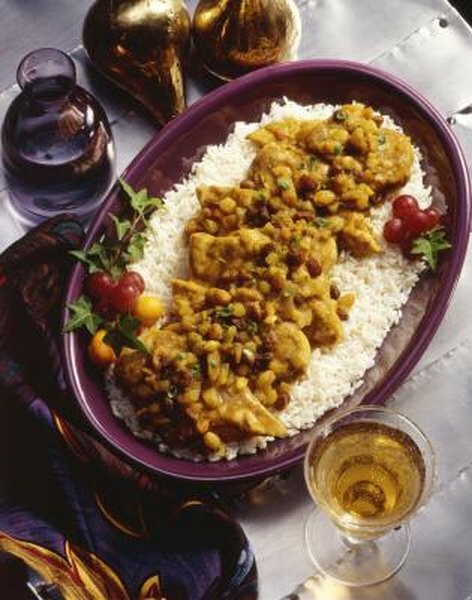 You may use both curcumin and cumin in curry dishes. Cumin also flavors chili dishes, desserts, condiments and alcoholic beverages. Cumin oil provides fragrance to perfumes, creams and lotions. Curcumin is used as a food coloring and may be added to mustard and butter. Curcumin stimulates bile production, and bile breaks down fats in the small intestine. Turmeric is officially approved for use in treating digestive problems in Germany, reports the University of Maryland Medical Center. Proponents of both herbs claim that they have antioxidant properties, meaning that they may reduce cell damage from harmful molecules called free radicals. Antioxidants may reduce the risk of some cancers, although clinical studies have not proved this benefit for either substance. Curcumin and cumin also may have as yet unproven antibacterial effects. More studies have been done on curcumin than cumin, but few are human studies. In a six-month study conducted by researchers from The Chinese University of Hong Kong, curcumin did not improve serum lipid levels in human subjects. The results, published in the December 2007 issue of “Pharmacological Research” tested 36 elderly subjects with 1- or 4-gram daily doses of curcumin or placebo. More studies have been done on black cumin than cumin. Do not substitute either cumin or curcumin for traditional medical treatment for disease. Cumin may increase sun sensitivity and could cause low blood sugar. Curcumin also can lower blood sugar levels. If you have diabetes, watch for signs of low blood sugar, or hypoglycemia, if you consume large amounts of either of these substances. Curcumin also can cause stomach upset and may increase your risk of developing stomach ulcers. Curcumin could increase bleeding tendencies if you take blood thinners and may increase stomach acid production.